With the students back on campus and the hints of fall color returning to the trees, we can feel autumn coming upon us. During this time our year our focus shifts from planning and implementing the releases of our Leucopis silver flies to rearing and releasing Laricobius beetles. This year, in addition to maintaining a Laricobius colony, we are developing new protocols for rearing silver flies in a laboratory setting, thanks to work from our brilliant post-doctoral researcher Samita Limbu. This marks the first successful rearing of Leucopis argenticollis and L. piniperda in a lab ever, and a very exciting expansion of our biocontrol research! It is difficult to rear silver flies in a lab setting. They require ample HWA to feed upon and lots of care and attention as they move quickly through their life stages. While it is possible to supplement the silver fly diets in other ways, providing them with enough HWA to keep a thriving colony going is a major challenge especially since the members of our Laricobius colony are also hungry after emerging from pupation. At this time of year, adequate food resources can be hard to come by since HWA is dormant in its summer aestivation phase. While we have infested foliage stored in the lab, we have to stretch these meals until HWA is active again and we can collect more HWA. There are other additional challenges as we embark on this new path. 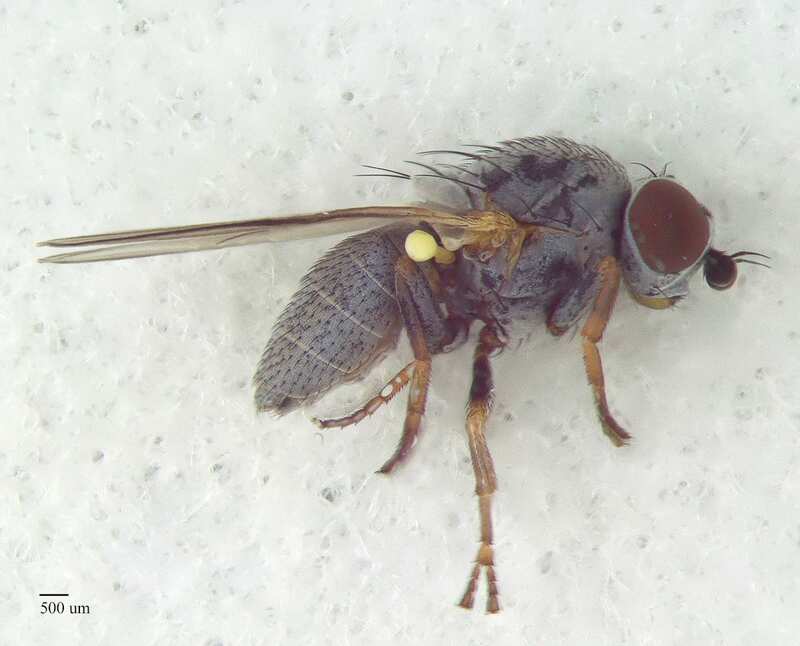 Since rearing these silver fly species in the lab has not been done before, we are in the midst of a long-term learning process as we hone our fly-rearing techniques. First, we don’t know when silver fly egg-laying takes place or where the eggs might be in the foliage after we release them into their feeding cages in the lab. 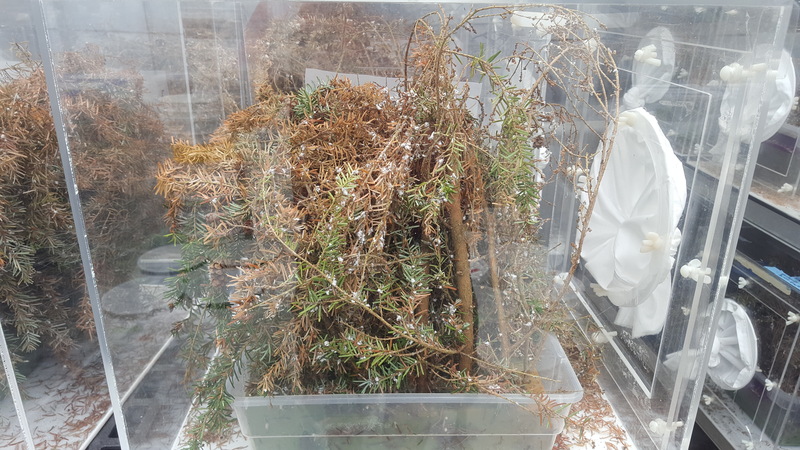 As the hemlock foliage dries out in the cages, we could lose precious eggs if we take it out too soon, but infested foliage must continually be replaced to provide the silver flies with adequate amounts of HWA to feed upon. Second, we still must develop a faster and more efficient system for gathering silver fly larvae and adults from cages when it is time to change out foliage. With so much work going on in the lab in the fall season, time management becomes key to successfully raising two separate biocontrol colonies. As we continue to troubleshoot our methods beyond the second generation of flies, we are looking forward to expanding our program and our capacity to implement biocontrol as a successful HWA management strategy in New York. We anticipate some learning curves along the way, but this research marks a big success for the New York State Hemlock Initiative and for biocontrol of HWA.